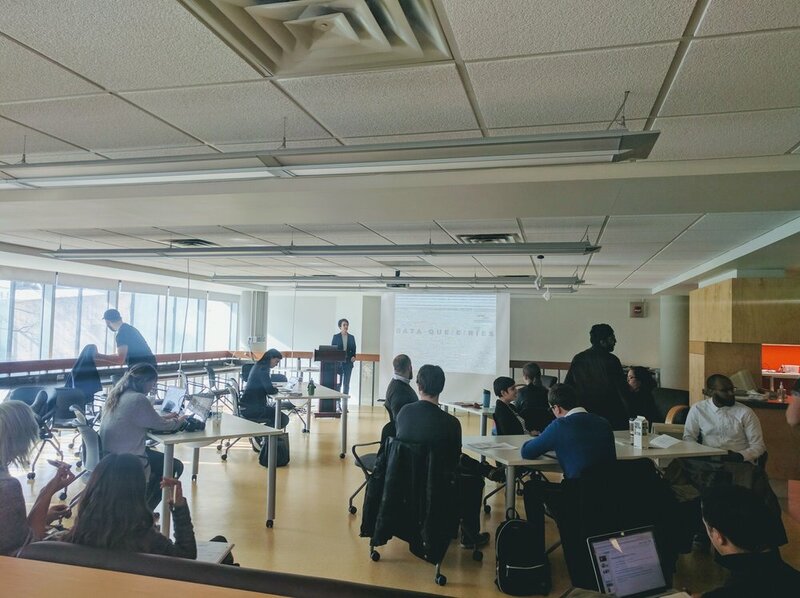 On Wednesday, February 15th students and faculty from York University and Ryerson University gathered at Ryerson’s Student Learning Centre for a public seminar on Research-Creation and Public Intervention: Critical Methods for Engaging People. Presentations were made by May Chew, Cyrus Sundar Singh, Mary Elizabeth Luka, and Layne Hinton; a roundtable discussion followed. 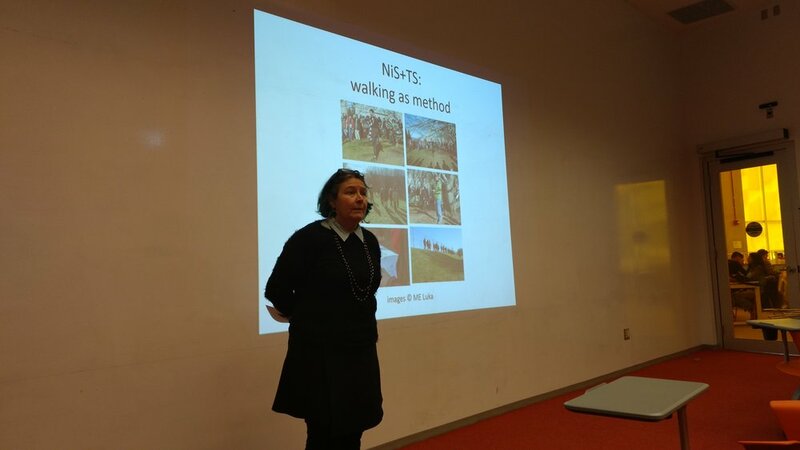 The seminar began with May Chew (Post-doctoral fellow in Urban Public Space, York University) presenting the Houses on Pengarth project led by Professor Janine Marchessault, York University). Rather than being left dormant and isolated, a block of row houses in Lawrence Heights, Toronto will be converted into cultural incubator spaces. These spaces will engage civic participation and house critical discussions around the role of art and redevelopment. Chew discussed future plans, such as how to help local organizations and collaborate with them. This emphasizes the importance of creating a dialogue with not only the space you are working with, but with the very spaces, individuals, and communities that surround it– neither exist in a vacuum. Chew also stressed the importance of process: how crucial it is to minimize disrupting the public during development and how failure is actually a quite useful and important component of process. In re-evaluating “failure” and its value, we can shape experimentation as praxis. It is also important to re-evaluate our ideas and check our privilege in what is “high” art versus “low” art – how can we challenge our learned grammar of what art is? How can we carve out more democratic spaces in the city in the future? 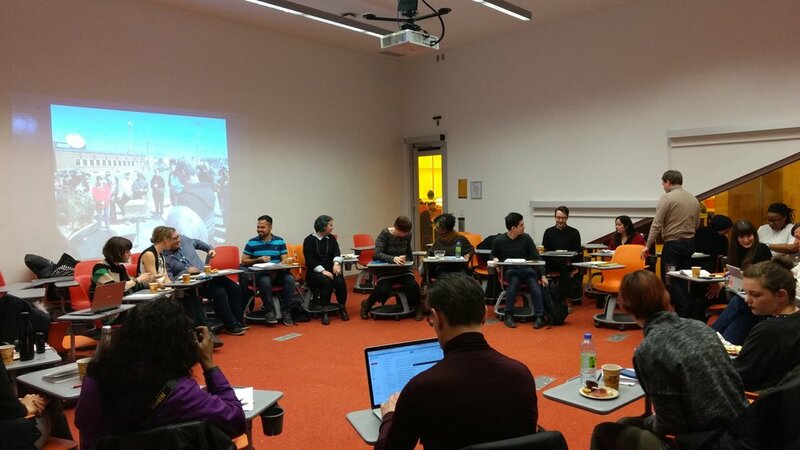 Next up was Cyrus Sundar Singh (PhD candidate at Ryerson/York University), who engaged the group in a lively improvisation activity to illustrate the conflict of Africville, Nova Scotia. In the 1960s, government officials forcefully evacuated members of the community, who were mainly Black Canadians. Their homes and their church were demolished as soon as they were evacuated, for the sake of “urban renewal” and “redevelopment.” Eventually, in 2010, the mayor issued an apology, and renamed the park where most of the community had been located “Africville Park” as a commemorative piece of land – though this modest gesture understandably did not fully satisfy many of the former community residents. 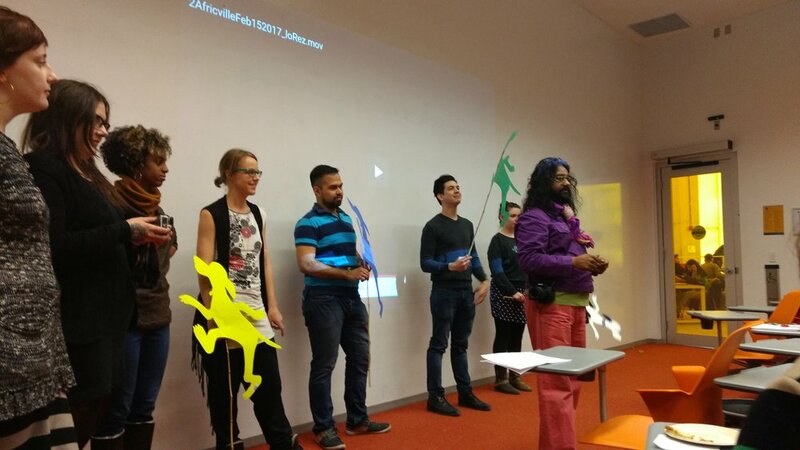 Singh selected participants in the room at random and grouped them into roles to play out a subsequent controversy. Some represented dog owners frequenting Africville Park, some became community members of Africville engaging in protest, one was selected as mayor, and a few were chosen to play the press! Participants engaged in improvised arguments which addressed sentiments of ownership, entitlement, and intervention. Singh also discussed his own process with his site-specific live-documentaries, emphasizing the importance of audience and story, as well as acknowledging your own intervention. Mary Elizabeth Luka (Banting Postdoctoral Fellow, York University) explored walking as method, using the Halifax explosion of 1917 as a case study. She is a co- founder of Narratives in Space + Time Society, a research and artist group focused on projects involving walking, history, and mobile media. Walking through sites of the Halifax explosion awakened themes of destruction and reconstruction, as well as methods of coping with disaster and the importance of relief efforts. 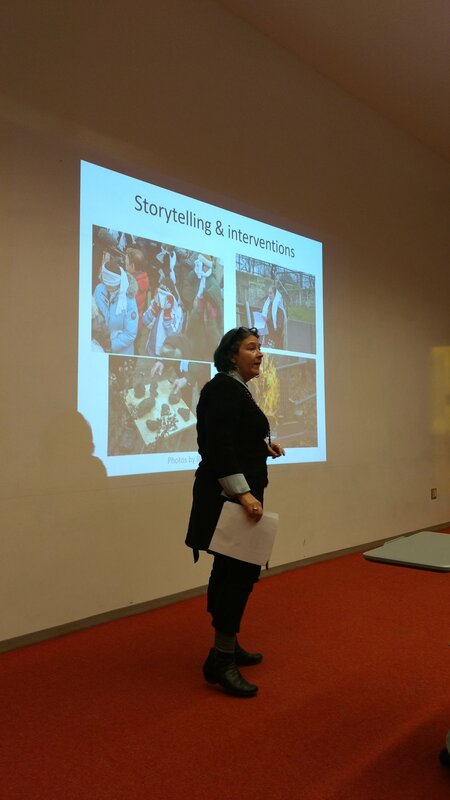 Luka discussed how storytelling and walking with your community are useful tools to retracing the past, making connections with the present, as well as imagining a different future. How can artists act as cartographers and remap what the city looks like? Furthermore, by utilizing an updated “walkthrough method”, we can better understand the space we inhabit and the stories embedded into it. Luka mentioned the importance of marking trauma in the form of giveaways and sculptural objects—these marks are not only crucial as they are commemorative, but also in public spaces that encourage conversation. Last but not least was Layne Hinton, Co-artistic Director of In/Future Toronto: A Transformative Art Experience, in September 2016. The project utilized the rich, historic space of Ontario Place, which opened in 1971 (arguably a response to Montreal hosting the successful Expo 1967). Hinton described the event as a “cultural barn-raising,” bringing together 30 arts organizations and more than 100 public art installations from Toronto with an emphasis on making the festival more creative and site-specific instead of corporate. Time was also an important concept– what is the relationship between the past, present, and future? What do we learn about ourselves in the present when we look at the past to envision the future? Artists used existing surfaces in Ontario Place, adding layers to the history. The event was ultimately a negotiation and exploration of using spaces that were in transition between time, space, and meaning. The roundtable discussion that followed the presentations was invigorating and thoughtful. Luka asked: how do we surface the actual experts of an area as method? We are not the experts of the area – the locals are. How can we involve the public and the community? 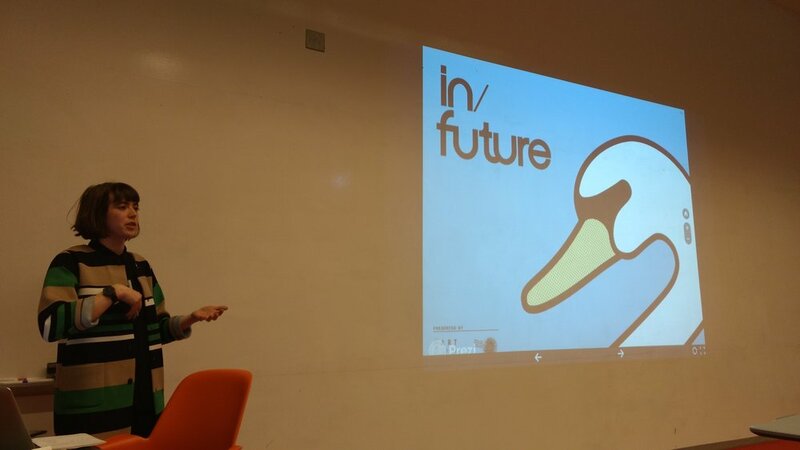 She also discussed the notion of going slow and building long-term relationships that extend past a project. This drew ties with the Houses on Pengarth project and Africville– with so many spaces becoming increasingly gentrified, how do we ensure that a dialogue with community members is being maintained? Who owns the land, who is taking it, and who is it being taken away from? How can it be given back, and how can it be reclaimed? 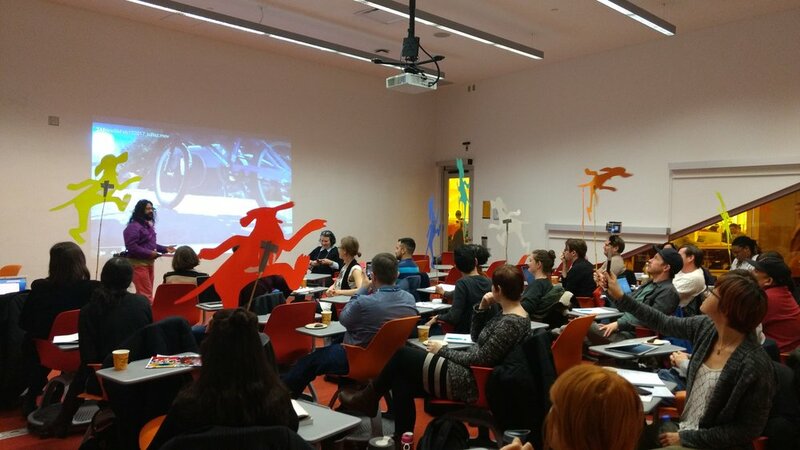 This public seminar addressed a variety of methods in which space can be utilized and explored through critical thinking and artistic creation.